Sand is a bit meh: I dislike babies covered in sand, I dislike baby’s food covered in sand, I dislike babies eating sand but I accept it’s a professional liability. The other week I profiled Be Live Family Costa Los Gigantes in, unsurprisingly, Los Gigantes, Tenerife. This area is a hugely popular family destination. I was asked if there’s a beach near the hotel and the answer is YAY! To some people a hotel without a beach within walking distance does not cut the mustard. Before children I loved beaches. Now I love the water but sand is a bit meh: I dislike babies covered in sand, I dislike baby’s food covered in sand, I dislike babies eating sand but I accept it’s a professional liability now I’m a mum. The kids love it of course, and deep down I have a soft spot for their antics. Be Live Family Costa los Gigantes has a lovely little beach nearby, La Arena, but even if you’re a fully paid up member of the anti-sand league like myself the Tenerife beaches are different. The comedy potential is desperately high. The sand is black, due to the volcanic nature of the islands, and it leaves your kids wide open to look utterly ridiculous. Your kids are clarted within moments of suncream application. They look preposterous and I quite like laughing at my own children, it makes up for the interrupted sleep. Mr Baby fell over (though I deeply suspect he was pushed) and he emerged with half his face covered in black sand – he looked like the ying and yang sign – there was an audible gasp from other holidaymakers as he emerged from the sand, then I heard titters. I don’t have a photo as first priority was pouring a bottle of mineral water over his head to get sand away from his eyes, nose and mouth – he cried. 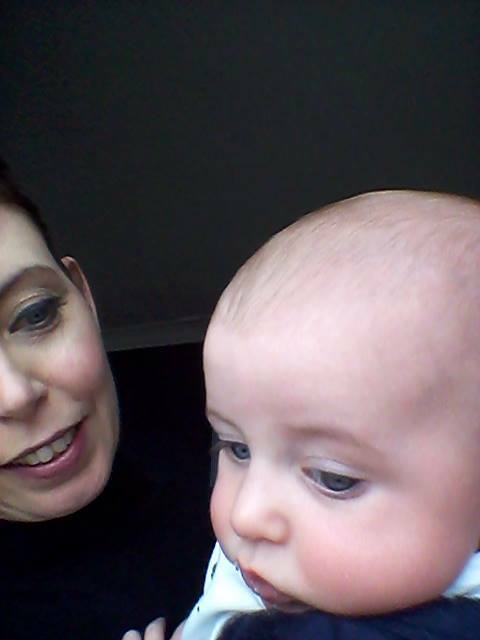 Mr Toddler after suncream application – Can I get a cuddle mummy? No. and the sign saying don’t remove sand from the beach is a joke but we did get clean enough to try a lush beachside restaurant. Pancho is steps away from the beach, very chilled, lovely lunches, lots of shade, a high chair for Mr Baby and beautifully dressed tables. Seafood was high on the menu and we fed the children off our plates, rather than order an additional dish, which the staff had no problem with. It was a great, easy day out within walking distance from Be Live Family Costa Los Gigantes and is a great asset for Be Live to have on its doorstep. But I pity the fool who brings sand into my hotel room. We flew direct from Aberdeen to Tenerife with Barrhead Travel. The waves are high and strong at La Arena. There were lifeguards on duty who took their responsibilities very seriously and were quick to get tots out of the water quickly as it’s not swimming territory for little ones. Good for paddling, brilliant for older children and youthful adults to caper in, great for sandcastles but not always a swimming zone for little ones. I have a love hate with sand and my kids too, I get it! There is no fun without sand at the beach…the cleaning up afterwards is the pain but otherwise great fun!